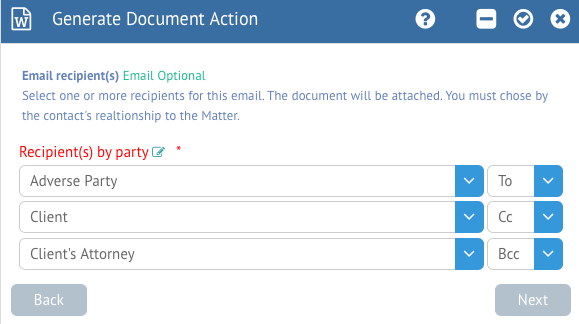 The second action that is listed from the left is the Generate Document action. 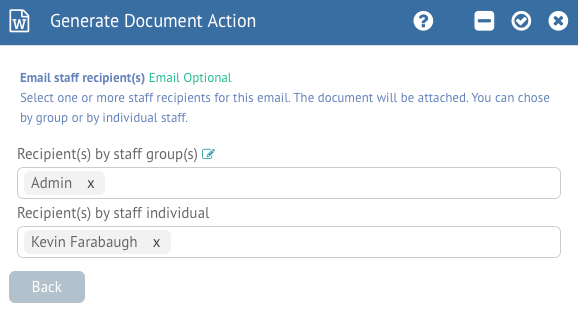 This will allow you to generate one or more documents for the selected Matter from any current templates, and then send that document to the specified Contact, Staff or Staff Group via a selected Email Template. The first screen when defining this trigger action will allow you to select which documents you want to generate. 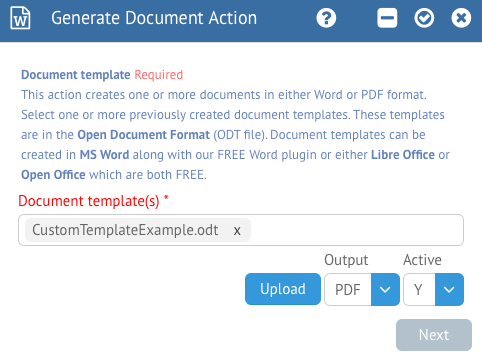 All document templates must be in OpenDocument (ODT) format; if you are using the MS Word plugin then chances are your template is already in this format. The fields will allow you to select one or more templates you wish to generate, al one with the output (PDF or DOC). You can deactivate the trigger without deleting it by switching the Active box from “Y” to “N” as well, and you can optionally upload a new template with the Upload button. Note that if all you want your trigger to do is generate a document, you can click the checkmark at the top right of the trigger action to Save the trigger and exit back to the Triggers screen. The next few screens will allow us to send the template result via email. For now, click Next to proceed. 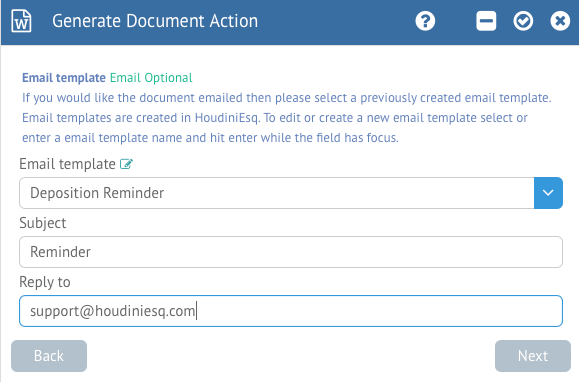 You can select an associated Email Template from the list to use to send the Document which was generated, and optionally enter a specific Subject and Reply To address in the fields. Click Next to continue. The next screen will allow you to select up to 3 Related Parties as recipients. You can specify whether they will be in the To, Cc or Bcc (Blind CC) fields of the email recipients as well. Click Next to continue. Finally, you can select whether you want Staff to be CC’d on the email in the last screen. You can select an entire Staff Group, or a specific Staff member. Once finished, click the checkmark in the top right of the form. If you would like to Delete this trigger altogether you can click the (-) button instead.